Download "ASSEMBLY, No. 1756 STATE OF NEW JERSEY 215th LEGISLATURE"
6 change a completed appraisal report submitted by an appraiser without the appraiser s written consent, except as necessary to comply with statutory and regulatory requirements. 16. (New section) a. The board shall issue a unique registration number to each appraisal management company that is registered in this State. b. The board shall maintain a published list of the appraisal management companies that have registered with the board pursuant to this act and have been issued a registration number pursuant to subsection a. of this section. c. An appraisal management company registered in this State shall disclose the registration number provided to it by the board on any engagement documents presented to the appraiser. 17. (New section) a. Except within the first 90 days after an appraiser is first added to the appraiser panel of an appraisal management company, an appraisal management company shall not remove an appraiser from its appraiser panel, or otherwise refuse to assign requests for real estate appraisal services to an appraiser without: (1) Notifying the appraiser in writing of the reasons why the appraiser is being removed from the appraiser panel of the appraisal management company; (2) Notifying the appraiser of the nature of any alleged conduct or violation, if the appraiser is being removed from the panel for illegal conduct, violation of the Uniform Standards of Professional Appraisal Practice, or a violation of State licensing standards; and (3) Providing an opportunity for the appraiser to respond to the notification of the appraisal management company. b. 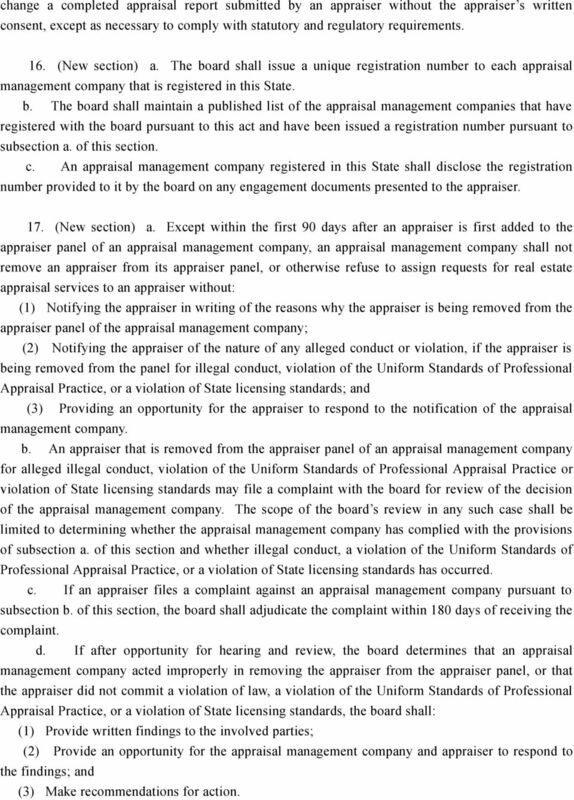 An appraiser that is removed from the appraiser panel of an appraisal management company for alleged illegal conduct, violation of the Uniform Standards of Professional Appraisal Practice or violation of State licensing standards may file a complaint with the board for review of the decision of the appraisal management company. 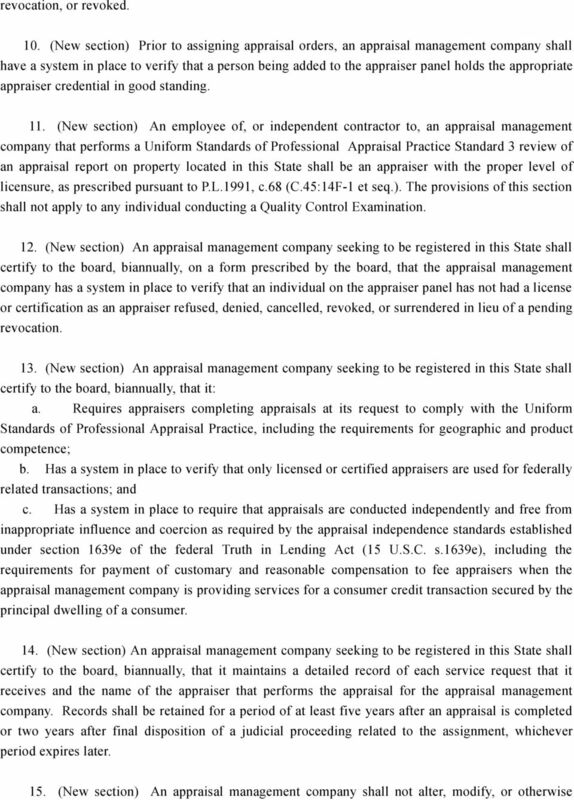 The scope of the board s review in any such case shall be limited to determining whether the appraisal management company has complied with the provisions of subsection a. of this section and whether illegal conduct, a violation of the Uniform Standards of Professional Appraisal Practice, or a violation of State licensing standards has occurred. c. If an appraiser files a complaint against an appraisal management company pursuant to subsection b. of this section, the board shall adjudicate the complaint within 180 days of receiving the complaint. d. If after opportunity for hearing and review, the board determines that an appraisal management company acted improperly in removing the appraiser from the appraiser panel, or that the appraiser did not commit a violation of law, a violation of the Uniform Standards of Professional Appraisal Practice, or a violation of State licensing standards, the board shall: (1) Provide written findings to the involved parties; (2) Provide an opportunity for the appraisal management company and appraiser to respond to the findings; and (3) Make recommendations for action. 8 the board shall serve more than two successive terms in addition to any unexpired term to which he has been appointed. The Governor may remove a member of the board for cause. (cf: P.L.1991, c.68, s.3) 21. 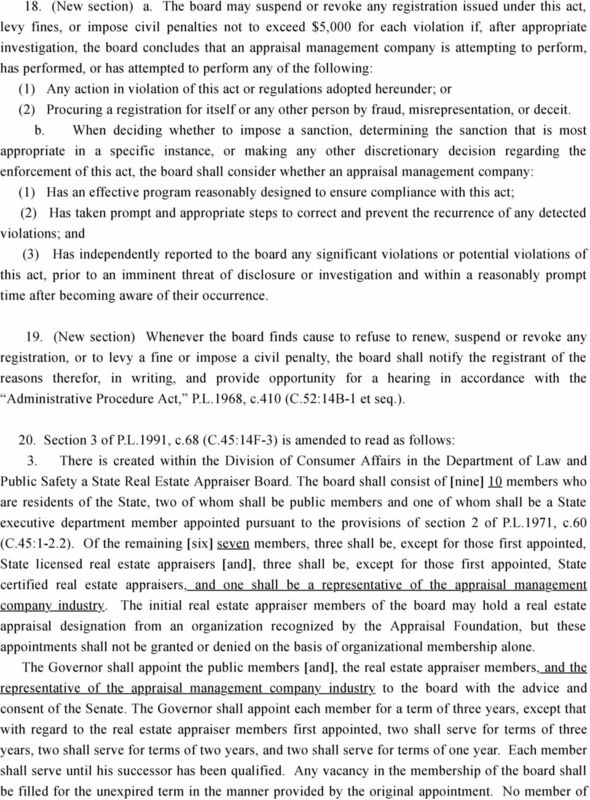 (New section) The State Real Estate Appraiser Board shall adopt rules and regulations pursuant to the Administrative Procedure Act, P.L.1968, c.410 (C.52:14B-1 et seq. ), necessary to effectuate the provisions of this act. 22. 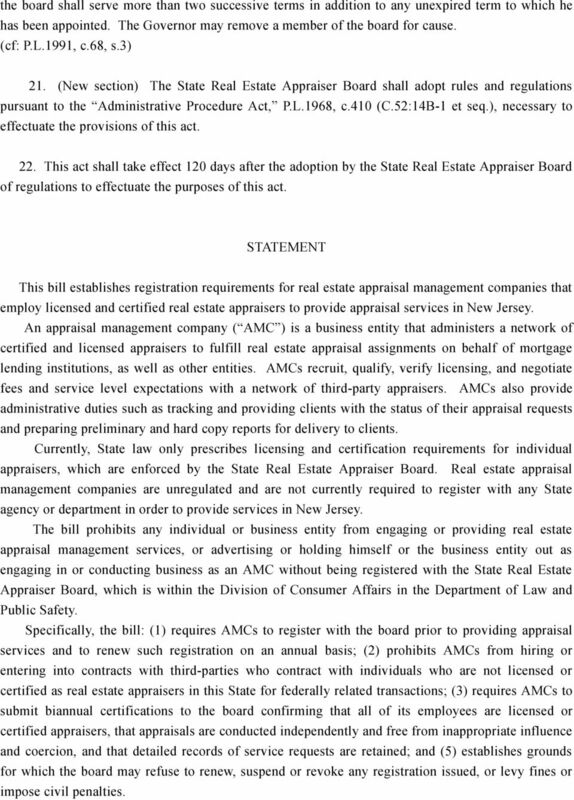 This act shall take effect 120 days after the adoption by the State Real Estate Appraiser Board of regulations to effectuate the purposes of this act. 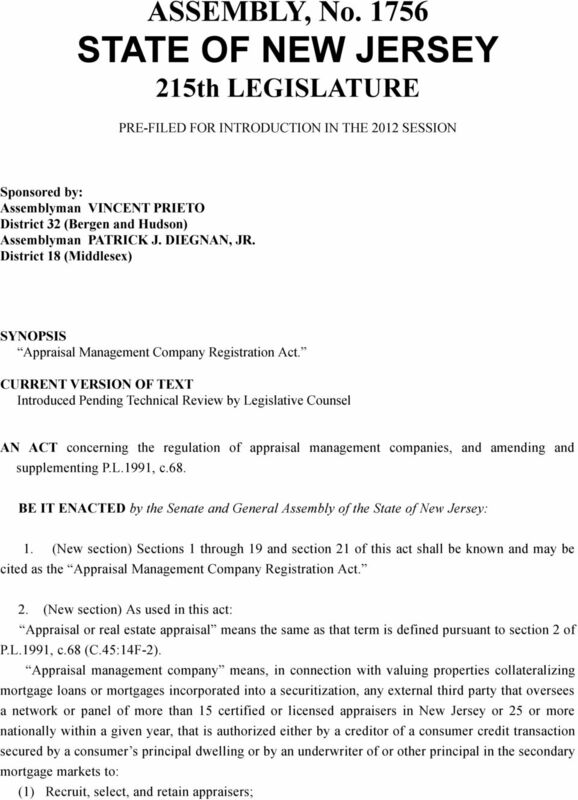 STATEMENT This bill establishes registration requirements for real estate appraisal management companies that employ licensed and certified real estate appraisers to provide appraisal services in New Jersey. An appraisal management company ( AMC ) is a business entity that administers a network of certified and licensed appraisers to fulfill real estate appraisal assignments on behalf of mortgage lending institutions, as well as other entities. AMCs recruit, qualify, verify licensing, and negotiate fees and service level expectations with a network of third-party appraisers. AMCs also provide administrative duties such as tracking and providing clients with the status of their appraisal requests and preparing preliminary and hard copy reports for delivery to clients. 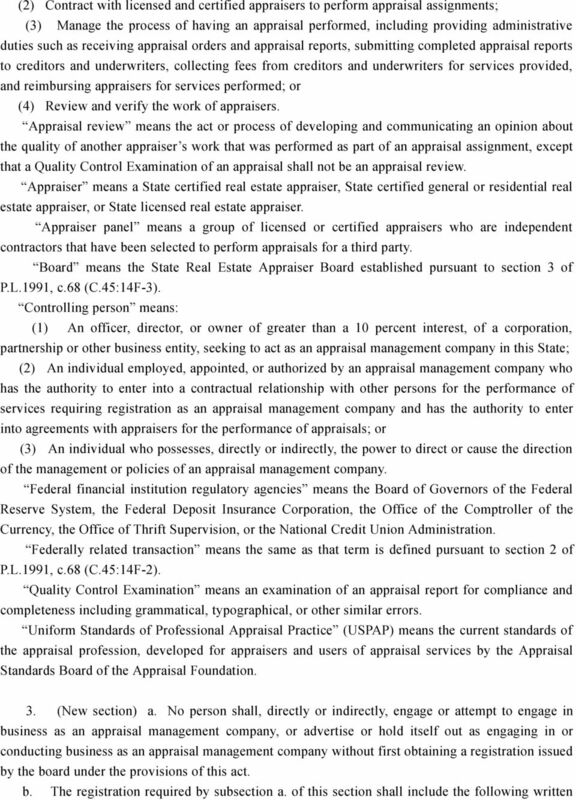 Currently, State law only prescribes licensing and certification requirements for individual appraisers, which are enforced by the State Real Estate Appraiser Board. Real estate appraisal management companies are unregulated and are not currently required to register with any State agency or department in order to provide services in New Jersey. 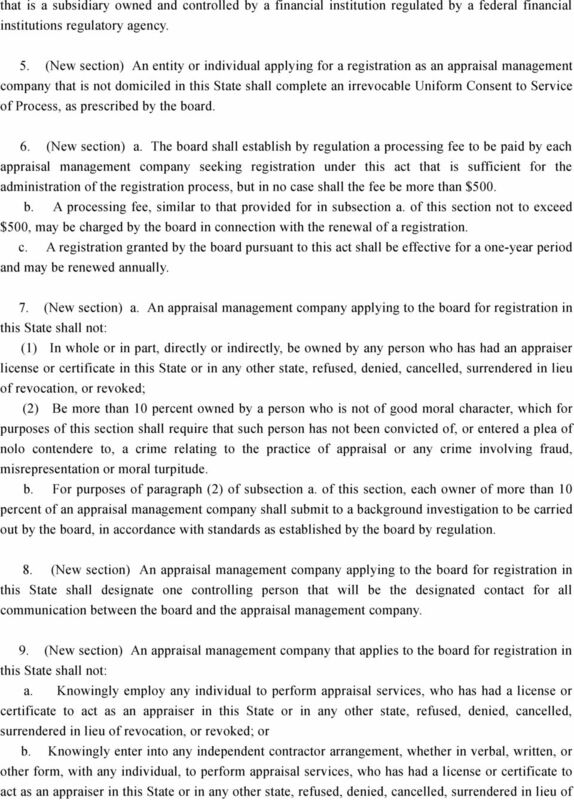 The bill prohibits any individual or business entity from engaging or providing real estate appraisal management services, or advertising or holding himself or the business entity out as engaging in or conducting business as an AMC without being registered with the State Real Estate Appraiser Board, which is within the Division of Consumer Affairs in the Department of Law and Public Safety. Specifically, the bill: (1) requires AMCs to register with the board prior to providing appraisal services and to renew such registration on an annual basis; (2) prohibits AMCs from hiring or entering into contracts with third-parties who contract with individuals who are not licensed or certified as real estate appraisers in this State for federally related transactions; (3) requires AMCs to submit biannual certifications to the board confirming that all of its employees are licensed or certified appraisers, that appraisals are conducted independently and free from inappropriate influence and coercion, and that detailed records of service requests are retained; and (5) establishes grounds for which the board may refuse to renew, suspend or revoke any registration issued, or levy fines or impose civil penalties. 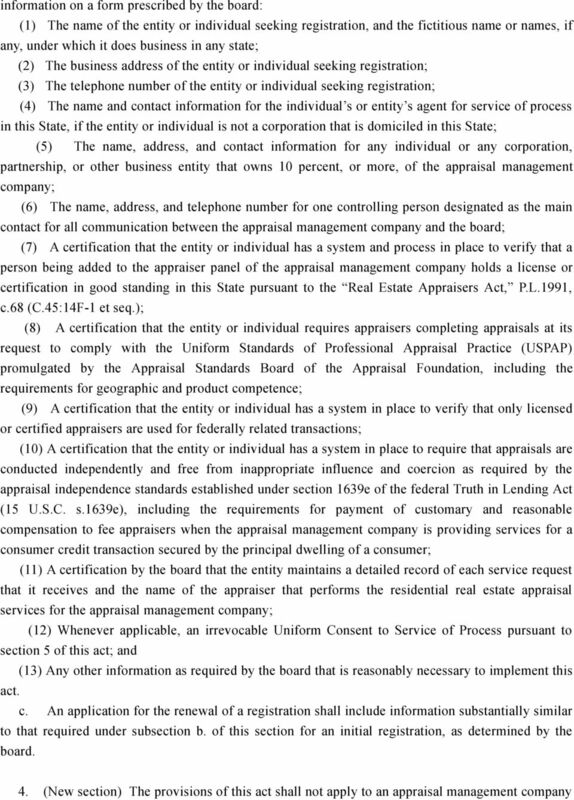 9 In addition, the bill amends section 3 of P.L.1991, c.68 (C.45:14F-3) to increase the membership of the State Real Estate Appraiser Board from nine to ten members by adding a representative of the appraisal management company industry to the board. Currently, the board consists of three licensed real estate appraisers, three certified real estate appraisers, two public members and one State executive department member. SENATE, No. STATE OF NEW JERSEY th LEGISLATURE INTRODUCED DECEMBER, 0 Sponsored by: Senator PETER J. BARNES, III District (Middlesex) SYNOPSIS Establishes licensure for associate marriage and family therapists. TABLE OF CONTENTS. This act shall be known and may be cited as the Real Estate Appraisers Certification Act. CHAPTER 331. C.45:2D-1 Short title. 1. This act shall be known and may be cited as the "Alcohol and Drug Counselor Licensing and Certification Act. SUBTITLE F IMPROVEMENTS TO THE ASSET-BACKED SECURITIZATION PROCESS. This Subtitle may be cited as the Credit Risk Retention Act of 2009. F-3) LICENSEE MUST RESPOND TO COMPLAINT OR AUDIT NOTICE IN WRITING.